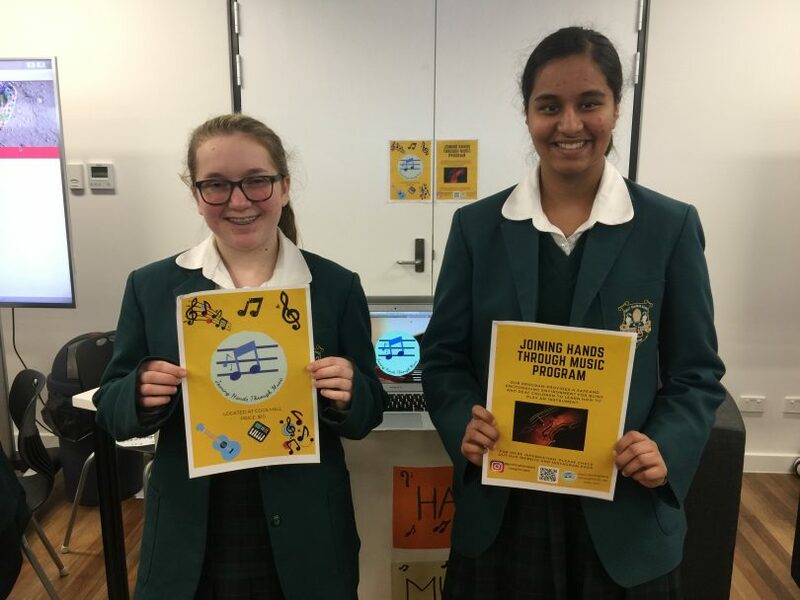 Canberra Girls Grammar School year 9 students and Directors of Joining Hands Through Music, Alexandria Benson and Meher Sandhu. Photo: Supplied. Canberra Girls Grammar School (CGGS) Year 9 students showcased the results of the second phase of the inaugural Ad Astra (to the stars) program in the recently opened multi-purpose Yhuuramulum building on Friday (8 June). The Ad Astra program sees students form small groups and over the course of four phases spread across the year, concept, pitch and develop projects that will nurture the heart of the nation, the ACT. The program focusses on developing the girls’ entrepreneurial skills, giving them the confidence and knowledge to take the world by storm. Professionals from local businesses have volunteered their time to deliver talks and mentor the teams. One team’s project, Joining Hands Through Music, is a program to teach blind and deaf children to play musical instruments. The program will be located at the CGGS Senior School. “Through CGGS the program can access a range of musical instruments, teachers and performance opportunities,” Alexandria further detailed. Alexandria and her team have also reached out to some of Canberra’s finest musicians, composers and teachers to participate in the program. “Our team chose to build a program around music because we believe that it can help build relationships, improve memory, creative thinking skills and much more,” Alexandria said. Joining Hands Through Music are calling for community support to donate musical instruments, follow them on Instagram and generally spread the word. Another team project is an initiative to develop a memorial that recognises the contribution of Marion Griffin to the layout of Canberra. The inaugural Ad Astra program at Canberra Girls Grammar is seeing the development of some great community programs and giving these young women the skills to become our leaders of the future. Do you think programs like this should be run for young women in all schools in the ACT?